When three members of the White Panther Party were accused of setting off bombs across Southeast Michigan, their case hinged on a crucial detail: Evidence of their guilt was acquired through wiretapping without a warrant. The case made it all the way to the Supreme Court and, today, collections at the Bentley document the details of this historic ruling. Just before midnight on September 29, 1968, a bomb went offin downtown Ann Arbor. Five sticks of dynamite blew a hole in the concrete and shattered the windows of a building at 450 South Main Street. The blast could be heard from Michigan Stadium all the way to the U-M hospital. No one was hurt in the explosion, and it fell off the front page of The Michigan Daily after one day. 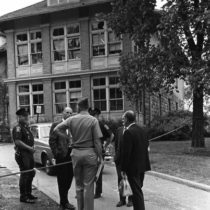 The most surprising part of the story for many locals was that the non-descript building targeted was a surreptitious CIA office, which had been recruiting U-M students for almost a decade. Two weeks later, another bomb exploded just before midnight, this time on University of Michigan property. The east entrance to the Institute of Science and Technology on North Campus was destroyed, but again no one was hurt. The Michigan Daily reported that some of the groups in the IST building were conducting “classified military research” funded by government agencies. A few months later, a third bomb destroyed a car parked in front of the U-M ROTC headquarters. The John Sinclair collection at the Bentley contains phone logs obtained from illegal wiretapping. The bombings were proof that Ann Arbor wasn’t immune to the upheaval happening across the country. Barely a year had passed since riots in Detroit killed 43 people. In August 1968, at the Democratic National Convention in Chicago, images of police violence against anti-Vietnam War protesters were broadcast to every TV in America. Just as the fall semester began at U-M, more than 200 protesters were arrested in Ann Arbor demonstrating against the jailing of a Michigan Daily editor. After a year of investigation, the FBI connected the three Ann Arbor bombing incidents to a string of politically motivated bombings in southeast Michigan. In 1970, a man named David Valler confessed to carrying out or aiding the attacks. 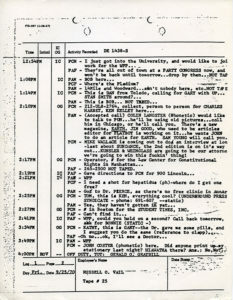 The FBI then used Valler’s testimony to charge three prominent Ann Arbor radicals with conspiracy: John Sinclair, John W. Forrest, and Lawrence “Pun” Plamondon. All were all members of the White Panther Party (WPP), a counterculture organization created in solidarity with the Black Panther Party. They were accused of helping Valler, who was not a member of the WPP, choose the bombing locations in Ann Arbor. Plamondon was also accused of planting the bomb at the CIA office. The FBI’s case against the trio included Plamondon’s recorded conversations from a phone wiretapped for an unrelated investigation. Much to the surprise of the WPP’s defense lawyers, the prosecution admitted during pretrial hearings that the FBI didn’t obtain a warrant for this wiretap. The FBI instead relied on a provision in the newly passed Omnibus Crime Control and Safe Streets Act of 1968, which gave them the power to monitor without a warrant any person or group they suspected of attempting to overthrow the United States government. Before the trial even began, the defense’s challenge of this warrantless wiretap made it all the way to the Supreme Court. While the original trial would have focused on determining the potential guilt and motivations of the White Panther Party for the bombings, the Supreme Court instead had to answer fundamental constitutional questions: Does the government have the power to surveil its citizens without due process guaranteed by the Fourth Amendment if it believes those citizens are plotting the overthrow of the government? If so, what are the limits of this power? It would be a decision of monumental importance made during a time when America seemed hopelessly divided. John Sinclair and his wife, Leni, had been involved in the intersection of music, counterculture, and politics in Michigan years before the trial. They spent the 1960s producing rock and roll concerts in Detroit while running the Trans-Love Energies Unlimited commune. As their group of artists and activists grew, so did the attentions of the police and unfriendly neighbors. After a firebomb attack on their commune in early 1968, the Sinclairs, Plamondon, and a handful of other others left Detroit and moved to new headquarters, the “mansions” at 1520 and 1515 Hill Street in Ann Arbor. 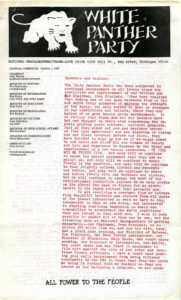 A White Panther Party memo. When the arrest warrants were issued for the conspiracy charges, John Sinclair was already in jail, serving 10 years for marijuana possession (months later, his infamous “10 years for two joints” sentence was overturned by the Michigan Supreme Court). Plamondon heard about his impending arrest on the radio and fled to Algeria. After making it onto the FBI’s Top Ten Most Wanted list, he and Jack Forrest, who’d been laying low in Michigan’s Upper Peninsula, were arrested near St. Ignace. The Supreme Court began hearing arguments on February 24, 1972. Both sides knew that this was going to be an important case. The constitutionality of the wiretapping laws was an open question, and the Attorney General’s office had passed on other potential test cases to bring this one to the Supreme Court. It was the best chance the newly elected Nixon administration had of defending the practice of warrantless wiretapping. Robert C. Mardian, head of the Internal Security Division at the Department of Justice, argued on behalf of the U.S. government. He said that when the FBI overheard Plamondon talk about the bombing case, they were in the process of monitoring an organization that “was engaged in activities of a type which would ultimately lead to the destruction for the United States government before some violence.” This was, he argued, a narrow exception to the Fourth Amendment’s guarantee of due process that was within the president’s constitutional power. The charges against Sinclair, Plamondon, and Forrest were dropped. The White Panther Party changed its name to the Rainbow Coalition and continued to make music and political manifestos. The Nixon administration wasn’t done with its wiretapping controversies. On June 17, 1972, two days before the Supreme Court would hand down its ruling, five men were arrested breaking in to the Watergate Hotel with wiretapping equipment. The Bentley Historical Library preserves and provides access to primary sources from this time, including the John and Leni Sinclair papers, the Pun Plamondon papers, the William T. Gossett papers, and the digitized Michigan Daily.